The winner of the Best Original Digital Billboard at The DailyDOOH Gala Awards was YESCO for YESCO Harmon Corner, Las Vegas. BroadSign’s Skip Beloff picked up the award on behalf of YESCO. 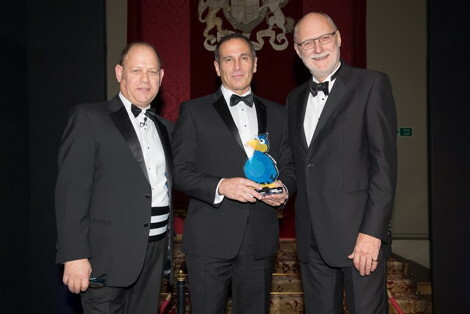 Shown above from left to right; Jeremy Jacobs (MC), Skip Beloff (BroadSign) and John Ellery (Executive Director, FEPE) who kindly presented the award on the evening. This entry was posted on Monday, December 2nd, 2013 at 03:00 @167 and is filed under DailyDOOH Update. You can follow any responses to this entry through the RSS 2.0 feed. You can leave a response, or trackback from your own site.